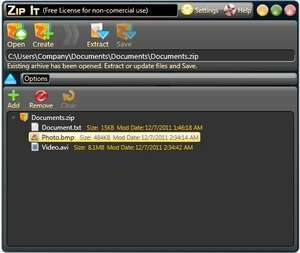 Zip It is a file archiving utility with support for ZIP compression archives, a free alternative to WinZip. Zip It supports advanced features for knowledgeable users such as integration into Windows Explorer/Windows Shell, support for self-extractive archives in the format of SFX and more. The user interface of this application is rather modern-looking and strays away from the typical look you might except from 90s era applications, most of which are not freeware. Zip It supports Windows drag-and-drop and through that, can quickly compress multiple files into one archive. Version 1.0.1.3 is a freeware program which does not have restrictions and it's free so it doesn't cost anything. For security reasons, you should also check out the Zip It download at LO4D.com which includes virus and malware tests. Additional screenshots of this application download may be available, too. 4.8 out of 5 based on 1 rating.